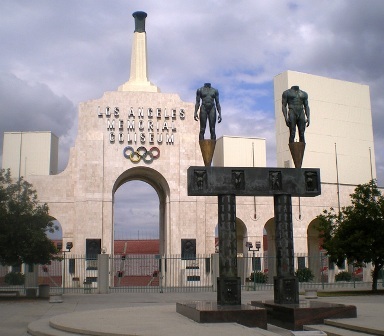 The nonprofit committee leading Los Angeles' bid for the 2024 Summer Olympics praised a $270 million renovation plan for the Memorial Coliseum Wednesday and said it was a significant step in the modernization of the venue. The Coliseum is central to the city's bid to host the Olympics, as it would be the site of part of the opening and closing ceremonies, as well as the track-and-field event. The venerable Exposition Park stadium was the site of the ceremonies and track-and-field for the 1984 and 1932 Olympic Games. The plan, which was approved recently by the Coliseum Commission, will be funded by the University of Southern California. The stadium is the home of USC's football team, the Trojans. "LA 2024 congratulates our partner USC for this major milestone in their mission to turn the L.A. Coliseum, our beloved L.A. sports cathedral, into a state-of-the-art stadium for the 21st century," LA 2024 CEO Gene Sykes said. The Coliseum Commission is made up of representatives from the city of Los Angeles, the county of Los Angeles and the State of California, and helps oversee the stadium's operations. The plan will have to be approved by the L.A. City Council before renovations can begin in the fall of 2017. Planned renovations include upgrades to the training facilities, wider aisles, and new restrooms and hospitality suites. "Overall, people love the Coliseum because of the history of it. I think if you can keep the history and bring up the experience you have on a game day, everyone will benefit," said Dan Stimmler, chief operating officer of the Coliseum. "The Coliseum has an amazing history and now will have the facilities to match that." Los Angeles is competing with Paris to host the 2024 Games, and the winning city will be selected in September, although L.A. could be awarded the 2028 Games instead.